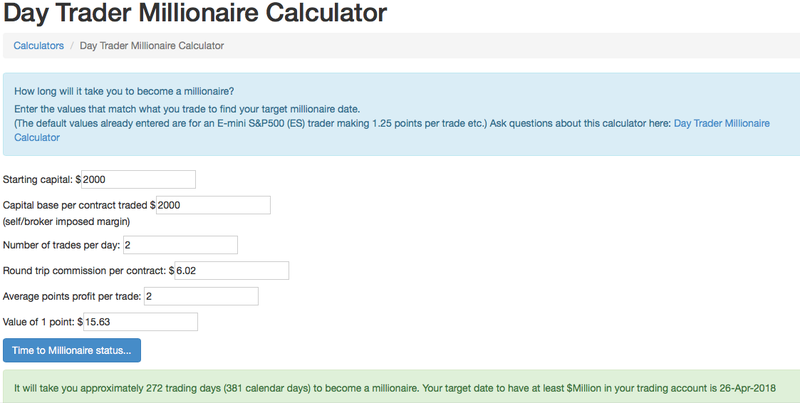 Here is a just-for-fun Day Trader Millionaire Calculator. How long will it take you to become a millionaire? This calculator compounds your trading result by always trading the maximum number of contracts that your capital base and margin allow. Post your questions about this calculator in this topic. I wasn't sure about the 5th parameter on your list: When you say "Average points profit per trade", do you mean total profits per trade (so in your example 1.25 points all together for each of the 2 trades per day), or do you mean "Average points profit per trade PER CONTRACT?" so you example would be twice as much for 2 contracts traded. Because the way it reads in your example, I can't come up with a million dollars in 215 days. Thank you. The Average points profit per trade is per contract. So the default values in the calculator state that a trader trades twice per (trading) day and that on each trade, all the contracts traded each make an average of 1.25 points. The net profit reduces this value to $230 as a result of the $20 commission for the 2 trades of 2 contracts each. The profit is $230 each day for the first 22 days until the capital passes the $15,000 mark and then the number of contracts traded increases to 3 and the profit per day jumps to $345. So day trading the calculation works with the assumption, to trade the maximum contracts your capital allows, yes? inventor: Correct. It demonstrates the equivalent of interest rate compounding in a bank account. It assumes that you maintain the margin ratio that you specify in the calculator which can be imposed by your broker or you can specify a higher margin requirement. Thanks for the Millionaire Calculator. I think the answer to this question is a true measure of the success of any individual trader or system. For example, if someone is trading just one contract and makes 240 ES points over the course of 240 trading days (one year), then the answer is 1! Let us assume conservatively that the starting capital used is $10,000 to cover for any early drawdown. Let us also assume that number of contracts traded will be fixed for 12 months. In other words, there will be no compounding. And finally, we will assume $5 commission per round trade per contract. This is an incredible return! Better than the average for CTAs and hedge funds put together, with rare exception. If you can set up a way that members of this forum can post their performance, perhaps anonymously for those wish to preserve their privacy, it would be quite insightful. The average of most trading rooms and signal services that I have monitored appears to be around 3 though I do know of one service whose average is currently at 4.56. Anouska, you bring up some good points. I have been thinking about writing something that will analyze my trading results and give me an insight into the types of trades that I make that are more profitable and sharing that with everyone on the forum. For example, the ability to upload all trades from your broker's account and then analyze them and see which types of trades are more profitable by a number of different types of metrics such as time of day, type of entry, length of trade etc. If and when I get that written I'll make it available and then if members give their permission their results can be anonymously aggregated to get the average profit that traders make. This sounds too good to be true. am I inputing something wrong? You're making $5 * 5 ($25) less $4 = $21 per trade and you do 1 trade per day. That's a 2.1% return on capital (21/1,000) each trading day. Remember that the banks are currently offering about 0.5% per year and you're making 4 times that per day. Compound that (i.e. you're trading more contracts as your capital base grows) and that's how you get to that answer. The only problem is that you're not going to make that type of return every day. That would be wonderful! Thank you Day Trading.